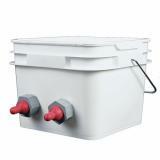 Use this easy to attach and remove lid to cover Premier's 2 gallon and 4 gallon square buckets. Much easier to attach and remove than the original square lid. Fits all previous Premier square buckets. 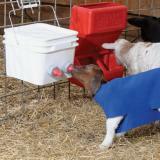 Protects feed from birds, rodents. 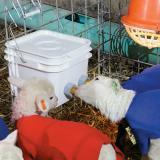 Keeps feed and mineral dry if bucket is left outside. My entire order was great. My goats love it and so do I. Excellent lid! 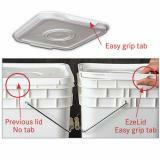 So much better fit and easier to get off (with your hands full) than other lids that come with the buckets. Fits the bucket well. 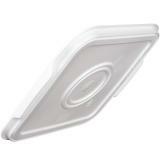 Easy to take on and off but it stays on tight enough that the babies can't knock it off. Works great, easy on and off. The easy pull tab wasn't easy to pull and we had to make some adjustments with a knife to be able to get it on and off easily. Once that was fixed, it worked fine.